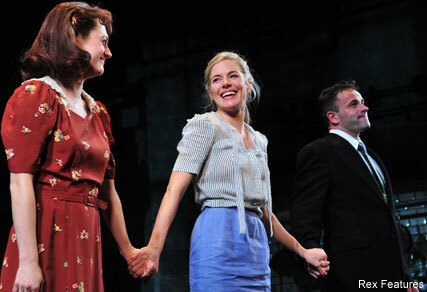 Sassy British starlet Sienna Miller took to the stage last night in her debut Broadway performance… and the reviews are in. Starring in Patrich Marber’s adaptation of After Miss Julie, Sienna plays the title role, as a rich young woman looking after her father’s estate. Something of a theatre fledgling, Sienna was last seen treading the boards when she played Celia in a London production of As You Like It back in 2005. And after a recent string of bad press in the US, we were unsure what to expect this time round. However, reports suggest she really held her own. A Reuters review described her performance as ’emotionally charged’, while the New York Times gives her ‘points for courage’, for tackling what is known to be a very difficult role. So after first-night nerves, Sienna can rest easy. All in all, it seems her performance went down a treat. Also making his Broadway debut last night was the ever-handsome Jonny Lee Miller, who has received rave reviews for his role as Sienna’s love object, John. Working the red carpet after the performance, Ms Miller wore a shimmering metallic Balmain dress, hot off the spring/summer catwalks. Many stars turned out in support, including the gorgeous Rachel McAdams and Claire Danes.